In an avalanche of fantastic news this week, I received official notification from FitBloggin that I will host a panel at the upcoming FitBloggin15 conference in my home town of Denver, Colorado June 25-28, 2015. I have never attended, but did follow vicariously last year online. My life is crazy busy and missed the application deadline last year. I've always wanted to participate in such an event. I'm so honored and excited to be a part of the team. I will be hosting a session on growing your blog presence through social media on Friday at 9AM. I applied after I'd posted my Blueprint For Building a Blog Brand blog post. I solicited input from several other bloggers and got some fantastic input on how to navigate the murky waters of social media and ambassadorships and thought it would be a perfect topic for the conference. More details will come out as the event approaches, but registration is open and expected to fill up so book your ticket and bring your rotten fruit and vegetables to toss at yours truly. 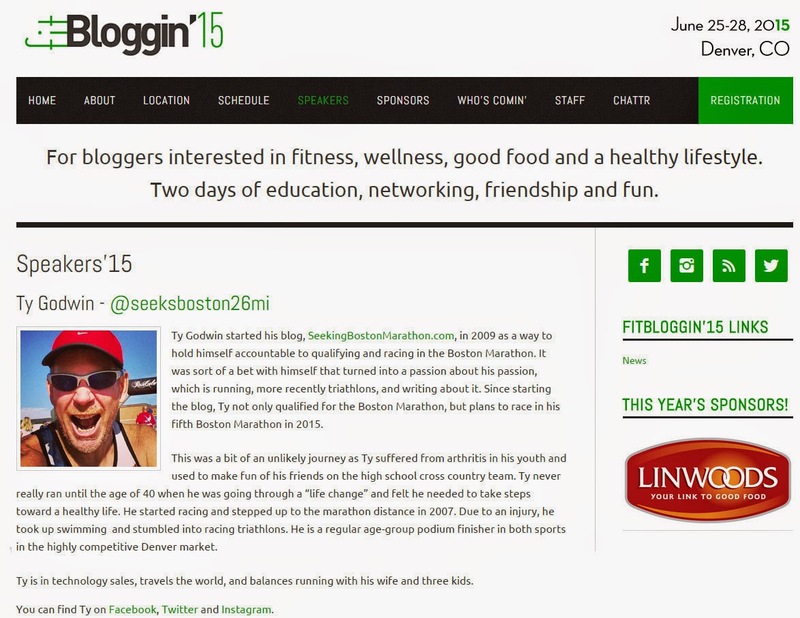 Thanks to Roni and the good folks at FitBloggin to include SeekingBostonMarathon. Looking forward to it!